Consideration of the use of foil, as an intervention, to reduce the harms of injecting heroin and cocaine. [UK] Advisory Council on the Misuse of Drugs. [UK] Advisory Council on the Misuse of Drugs, 2010. The evidence which led the UK government's drug policy advisers to call for the legalisation of the supply of foil by medical and drug services to drug users to promote transition from injecting to smoking heroin and crack cocaine. Summary Some drug services in Britain supply specialist foil to drug users to encourage smoking of heroin (often called 'chasing' – inhaling fumes produced by heating the drug illustration) and crack cocaine in particular as a safer alternative to injecting. However, this is illegal under section 9A of the Misuse of Drugs Act 1971, provisions intended to outlaw the supply of 'cocaine kits' (razor blades, foil and lemon juice) being marketed in the mid-1980s. Because of benefits including reducing the spread of blood-borne diseases, an exception was made for sterile syringes and needles, and then later for other equipment used for preparing drugs and for injecting, including swabs, containers, acidifiers, filters and water ampoules. Foil, used not for injecting but for smoking, was not exempted. However, foil provision by harm reduction services is rarely prosecuted. Instead police forces warn services or explicitly agree that no action will be taken. The Advisory Council on the Misuse of Drugs – an expert body set up under the Misuse of Drugs Act to advise government – considered whether there were grounds for legalising foil provision, producing in 2010 the featured report, followed in 2011 by a supp lement on possible health risks of smoking drugs from foil. Both documents are drawn on in this account. A major consideration was the council's earlier conclusion that, "Ultimately we need to stop injecting to reduce the risk of [hepatitis C]". Two key UK studies provided evidence of how the provision of foil might reduce harm among injecting drug misusers. An evaluation of supplying foil packs to promote transition away from heroin injecting to inhalation analysed data from four needle and syringe programmes and interviewed injectors at one programme. It found that the packs were taken when available, that offering them could be a useful way of engaging attendees in discussions about ways of reducing injecting risks, and suggested that supplying foil could reduce injecting in areas where there was a pre-existing culture of 'chasing' heroin. A second report Boid. A., Waldock. D. "The introduction of aluminium foil to Sidney Street Needle Exchange and Sharp Action mobile needle exchange Sheffield." Turning Point, 2008. provided feedback on a trial scheme providing foil from a site-based and a mobile exchange, which indicated that this reduced injecting behaviour and promoted less risky alternatives. Surveys in Britain have also shown that needle exchange managers, commissioners, users and workers believe that providing foil would encourage drug users not to inject, but also that two thirds of services did not provide it because it was illegal. The Dutch experience indicates that provision of foil can provide a platform – when coupled with harm reduction messages and appropriate service provision – for transition away from injecting. In Amsterdam the proportion of drug users sampled over several years who were or had started injecting fell steadily following the introduction of harm reduction policies, including foil provision. The study concluded that a harm reduction approach did not lead to an increase in injecting drug use. A review of more than 15 years of Dutch experience in switching injectors to foil reported uniformly positive public health outcomes. However, respiratory complaints are regularly seen and these can be severe, emphasising the need for public health warnings to foil users. One concern is that users will inhale aluminium from the heated foil. However, the evidence provided to date does not indicate that levels of aluminium derived from the use of foil constitute a risk to the individual. Other concerns are the effects of inhaling the fumes of street heroin or crack cocaine or of inhaling hot vapour. Risks include a rare but potentially fatal form of brain damage from inhaling heroin (or its contaminants), and constructed airways due to heroin or cocaine, which can be particularly severe in asthmatic patients. 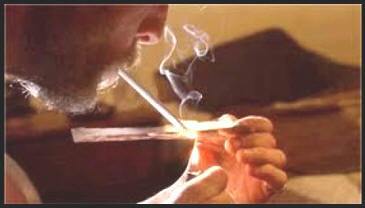 One study found a link between smoking heroin and shortness of breath. However, some of these results may have been partly due to a greater than usual prevalence of tobacco smoking among heroin users, particularly heroin smokers. Long-term cocaine smoking can lead to significant damage to the lungs, resulting in a range of chronic diseases. Smoking crack cocaine can also cause intense vasoconstriction resulting in severe chest pain, difficulty in breathing and fever, which may become a chronic condition with prolonged use. Damage may also occur due to the inhalation of chemical by-products or the products of the combustion of highly inflammable solvents used in the drug production process. Inhalation of hot drug vapour may in itself be associated with thermal damage to the lungs, but no studies were identified which had examined this in detail. A further concern is the risk of infection such as happens with injecting. Rates of infection in non-injecting heroin users are much lower than among injectors, though in respect of hepatitis C, still higher than in the general population, particularly among older users, those with tattoos, and crack cocaine users who share inhalation implements. How this happens is unclear, but given the high boiling points of cocaine base and heroin, and the very high temperature of foil when heated, it would seem very unlikely that viral infection could occur by this route, even if the cocaine or heroin was contaminated. The physical harms of smoking are significantly less than those associated with injecting. On the current balance of evidence, foil should exempted as a harm reduction intervention under Section 9A of the Misuse of Drugs Act 1971. In particular, the evidence indicates that there are no harmful effects from provision of foil and that it does not encourage use of illegal drugs. Potential benefits include: a decrease in blood-borne viruses; increased contact and engagement with drug service workers, offering opportunities to affect user behaviour and provide public health messages; fewer systemic infections; less soft tissue and venal damage; lower risk of overdose; and less litter related to drug use. Providing foil is in itself unlikely to significantly reduce blood-borne viral infections, but may (like other paraphernalia) play an important role within a programme of interventions if used to reinforce harm reduction messages on the dangers of injecting. • Services should provide a range of responses that support people away from injecting which can include substitute prescribing. • We should be mindful/aware of the signs and occasions when engaging with the service user to offer alternatives could instigate a change in behaviour. • Harm reduction providers should supply foil as part of a holistic range of harm reduction interventions which support a hierarchy of needs to promote individualised recovery goals and general health and well being. • Services must provide an environment affording privacy and dignity, where service users can speak confidentially and be supported by workers who are empathic and non-judgemental. • Services providing foil should ensure staff can effectively assess someone's risktaking behaviour including injecting risk. They should be able to articulate the risks versus benefits of safer alternatives such as smoking and 'chasing'. commentary Supplying foil is one of a suite of 'route transition interventions' reviewed for the Global Fund to Fight AIDS, Tuberculosis and Malaria, aimed at promoting non-injecting and safer routes of administration of illegal drugs. Although illegal, as the featured report observed, bona fide medical and drug services supplying foil in their professional capacities have very little in practice to fear from the law, and may be able to ease any remaining doubts by reaching agreements with their local police force. Foil for these purposes is openly supplied by a national UK social enterprise set up by drug workers. However, illegality on the statute book remains a significant impediment to implementation, creating the anomaly that needle exchanges can legally supply equipment to make the most dangerous method of drug use (injecting) somewhat less risky, but not to supply equipment which might support transition to a far less dangerous method (smoking). In the late 2000s attempts were made to remove or amend legal restrictions on supplying foil and other items by medical and drug services when acting in their professional capacity. These were accepted in principle by the government of the time but fell victim to the impending May 2010 election. Apart from illegality, another objection to foil provision may be cost, but in so far as it does reduce the number of injections, it will presumably also reduce the demand for injecting equipment from exchanges, saving money on that front. See this Findings analysis for more on the two UK studies which did most to help persuade the Advisory Council on the Misuse of Drugs to recommend legalising foil provision. Available elsewhere is a history of changes to the relevant provisions of the Misuse of Drugs Act, and an encapsulation of the current legal situation. A national supplier of foil offers extensive practice notes, drafted in collaboration with services distributing foil.